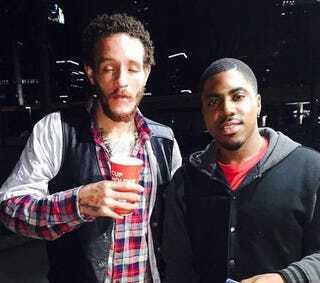 Delonte West (left) was reportedly seen shoeless wandering around a Houston Jack in the Box. It wasn’t so much the photo of former NBA point guard Delonte West in a flannel shirt and leather vest neatly hiding the hospital gown that threw me. It wasn’t West’s dazed look or his closed eyes or the report that he was shoeless in a Houston Jack in the Box parking lot. All those things can come back. Shoes can be purchased; a dazed look can return to clarity and purpose again; a hospital gown can be returned once a doctor has dismissed a patient with the proper diagnosis and treatment. In 2004, West was drafted in the first round after a historic run at St. Joseph’s University. In 2008 he was diagnosed with bipolar disorder. During his NBA career, West became famous for his off-the-court antics as much as for his on-the-court play. In 2009, West was arrested while speeding on a motorcycle in Upper Marlboro, Md. He was carrying two loaded handguns and a loaded shotgun in a guitar case, authorities said. In 2010, when he was a member of the Cleveland Cavaliers, rumors began surfacing that West had slept with LeBron James’ mom, claims that West denied. In 2011, during the NBA lockout, West tweeted that he had applied for a job at Home Depot. A month later, he posted a photo of himself in a delivery van, saying that he had gotten a job with Regency Furniture. Even though he’d made some $14 million up to that point, he was reportedly broke, having sold most of his cars and jewelry just to survive. In 2012 he signed on to play with the Dallas Mavericks, but the gun charge from 2009 made it almost impossible for him to rent a place to live. Not wanting to be a burden, he slept in his car or in the Mavericks’ locker room until team owner Mark Cuban heard about his player’s situation and helped find him a place to live. I’m worried about which Delonte West is lost, which life he isn’t about: the one who played more than 400 NBA games and finished with more than 4,000 career points, or the one who is having trouble finding his way because his playing days are behind him. If the photo is supposed to capture anything, then it really needs to serve as a rallying cry for those who love him to surround him and help him find the Delonte West he’s missing. This photo of a person is not Delonte West. It is a photo of Delonte West losing himself, and it isn’t funny or sad; it’s the direct reflection of mental illness left untreated. It’s difficult to go from being an adored player on star teams to a different phase of life, but for West, the work will always be twofold: to keep his mental health managed and to make sure he commits to that process so that he doesn’t lose himself. And that can’t happen alone. He’s going to need help, and my hope is that he hasn’t gone too far to be found.